Here we are again; another week, another Premier League XI. This time it’s coming courtesy of the all-conquering Spain, who – it probably hasn’t escaped your notice – have dominated international football for the past five years or so. There are plenty of trademark diminutive schemers to choose from here, but the defensive options are rather less plentiful. Still, have a gander at our XI and let us know what you think. GK: Jose Reina – The Liverpool glovesman may not be hitting the heights of previous seasons in 2012/13, but the 30-year-old ex-Barcelona shot-stopper deserves his place in the XI due to a number of outstanding campaigns between the posts for the Reds. 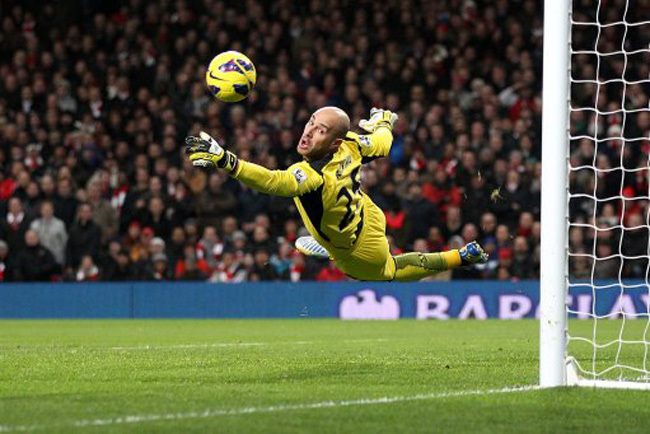 With Liverpool, Reina has won an FA Cup, League Cup and UEFA Super Cup. However, this could well be his last season at Anfield if the gossipmongers are to be believed. RB: Albert Ferrer – The Chelsea man gets in ahead of the likes of Alvaro Arbeloa, Michel Salgado and Angel Rangel in probably the most hotly-contested berth in this XI. Following a hugely successful stint with the Barcelona ‘Dream Team’ of the nineties, pacy full-back Ferrer moved to Stamford Bridge in 1998, immediately impressing and helping the Blues to secure their first-ever Champions League place as well as playing a key role on the way to their FA Cup success in 2000. Also picked up a European Super Cup with the west Londoners in 1998. 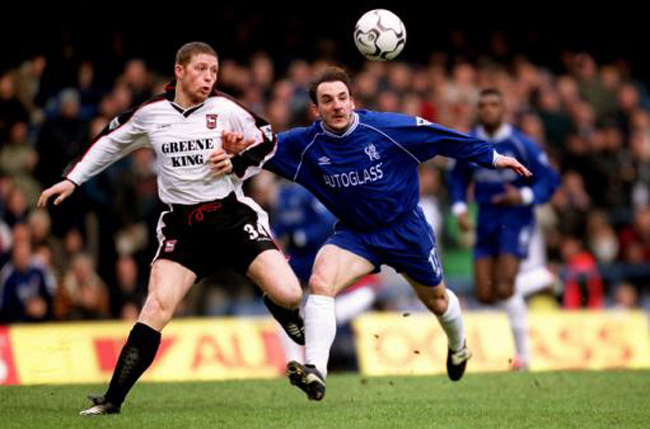 Retired in 2003 having seen his opportunities of first team football dwindle at the Bridge. 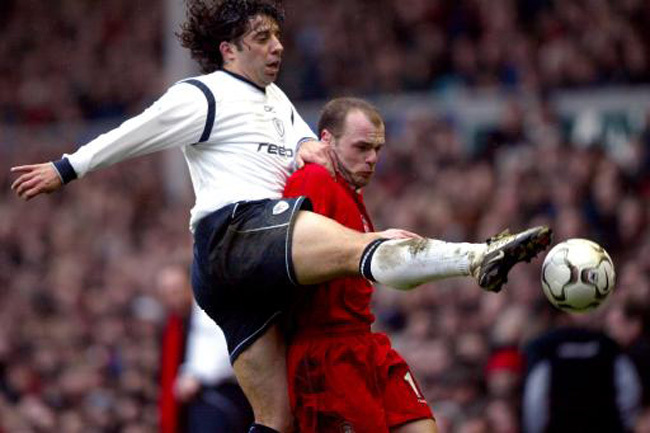 CB: Ivan Campo – Something of a cult figure at the Reebok, ex-Real Madrid defender/midfielder Campo enjoyed a superb time with Bolton, staying for five seasons and paying a key role in Sam Allardyce’s side. Comfortable in the centre of defence or in a midfield holding role, the shaggy-haired Spanish international was partial to a foul, picking up a fine collection of yellow and red cards. Left Bolton in 2008 and played a season with Ipswich in the Championship too. CB: Carlos Cuellar – Not the most glamorous of entries is Carlos, but the defender earns his place in the XI after his five seasons of consistence in the Premier League. Happy in either a right-back or central defensive berth, the ex-Rangers man was a combative, reliable and slightly undervalued presence in the back for for the Villans before moving to Sunderland at the start of the 2012/13 season. LB: Jose Enrique – Not many top notch left-backs to choose from here, but Liverpool’s Jose Enrique is a deserving entry, having impressed for both Newcastle and current club Liverpool. Joined the Magpies in 2007 where his technical ability and attacking play quickly impressed. Eventually moved to Anfield in 2011 where he has featured in both left-back and left-wing roles. Won the League Cup with the Reds in 2011. CMF: Xabi Alonso – An outstaning deep-lying playmaker with a world-class passing ability, Alonso came to England in 2004 where he blossomed in a holding role. Not afraid to get stuck in while also chipping in with some vital goals (usually from his own half! ), the midfielder’s departure to Real Madrid in 2009 is still seen by many Liverpool fans as one of Rafa Benitez’s biggest mistakes during his tenure. With the Reds, Alonso won the Champions League, European Super Cup and the FA Cup and helped the Merseysiders to a runners-up spot in the league in 2008/09. 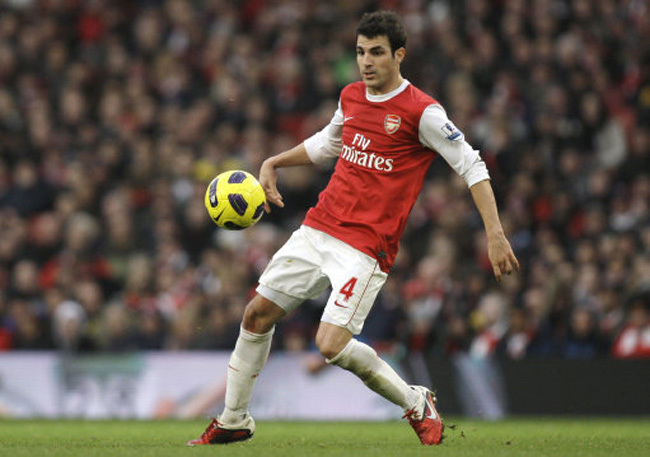 CMF: Cesc Fabregas – The man with Barcelona DNA (and a World Cup and two Euro gongs under his belt), Cesc moved to Arsenal in 2003 whilst still a young whippersnapper. However, he was soon knocking on the first team’s door, becoming the both the youngest player to play for the Gunners and their youngest scorer in his first year with the club. Was part of the Invincibles squad (although he didn’t receive a winner’s medal). Quickly turned into one of the best all-round midfielders in Europe, Cesc was made captain of the Gunners but ultimately the pull of his homeland was too much and eventually he left for Barcelona in the summer of 2011, with a solitary FA Cup win his only winners’ medal picked up with the Gunners, although he did help them to the Champions League final in 2006 (only to be beaten by Barca). CMF: Mikel Arteta – Another Barcelona youth starlet, 30-year-old Arteta made his name in the SPL with Rangers where his creative midfield play (often in a wide role) helped the Scottish giants to a plethora of trophies. After an unsuccessful period back in Spain, he moved to Everton in 2005, where his became an integral part of David Moyes’ midfield. Bought by Arsene Wenger at the start of the 2011/12 campaign, Arteta settled instantly in north London, eventually making the ‘pivot’ role his own in front of the Arsenal back-four. Like Xabi Alonso, he boasts a superb range of passing but also likes a tackle. Bizarrely, has never picked up a Spanish cap, even in a friendly. RMF: David Silva – A truly world-class player, the technically gifted schemer made his name with Valencia before eventually moving to Man City in the summer of 2010. Blessed with superb vision and quick feet, the diminutive attacker helped the Citizens to the FA Cup in 2011, having been deployed both on the flanks and as a second-striker. Was key to City’s historic Premier League success last season, with his impressive haul of 17 assists key to his side’s success. LMF: Juan Mata – Another former Valencia star, Mata almost joined Arsenal in the summer of 2011 as a replacement for the departing Cesc Fabregas. However, the Gunners dawdled and Chelsea swept in to get their man. Like many of his compatriots, Mata is technically outstanding, can dribble, score goals and set up team-mates in the blink of an eye. Currently enjoying another superb season for the Blues, the 24-year-old has already helped the west Londoners to a Champions League success and an FA Cup. CF: Fernando Torres – In his prime at Liverpool, Torres lived up to his El Nino nickname, ghosting past defenders and banging in 65 goals in 102 games. Strong in the air and pacy on the ground, Torres was idolised by the Kop but then, in January 2011, the striker moved to Chelsea for a whopping £50million. However, it’s fair to say that Torres has never lived up to his record transfer fee at Stamford Bridge, with injuries picked up throughout his career finally limiting his once explosive pace. Still, he has helped the Blues to a Champions League title as well as an FA Cup (not to mention his collection of gongs won with La Roja). But it is for his goal-filled time at Anfield that the striker earns his place up top in this XI. So, what do you think? Not enough decent defenders on show? And what about Alvaro Arbeloa, Michel Salgado, Chico Flores and Fernando Morientes? Should they have been in there somewhere? Let us know! as a ‘Pool man myself it makes me smile seeing so many ex LFC players and how well the spanish have done at Anfield. My only qualm, what no Riera? Not pushing for a starting place by any means, but Gaizka Mendieta should be on the bench ahead of Reyes and García.